Last night while I was watching The Voice, I noticed one of the contestants, Jamar Rogers from Cee Lo’s team wearing one of my favorite sneaker designs of all time. 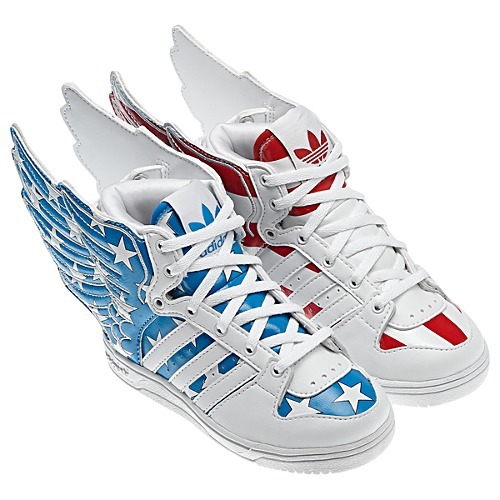 These unique sneakers are part of the Wings collection by Jeremy Scott for Adidas. Scott has been collaborating with Adidas on these unconventional trainers since 2009. 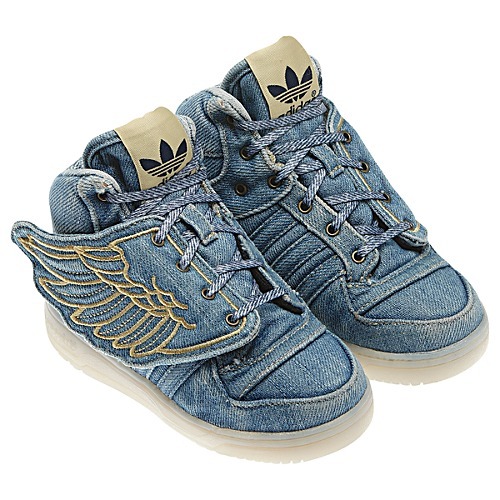 Each season he has brought us a slightly different approach to the Greek god inspired shoe with different colorways and slight changes to the wings. Always unusual and always fun, the Wings collection might be a little extreme for your child to wear everyday, and that’s understandable. They’re a lot of sneaker! And probably not the best choice for the shy and timid. But, for a kid like mine who’s not the most “athletically inclined”, wings on his feet might give him a boost of confidence to try and run with the big boys. How much are they btw? Do we know? They retail for $100.00. A little pricey for kids sneakers. But just think, they’d make the ultimate pair of baby shoes to bronze!! !